It’s been a long road trip for the Kansas City Royals. Beginning back on July 27 in Cleveland, KC added two major additions–Ben Zobrist and Johnny Cueto–to make a push towards the end of the season and the playoffs. After 10 games, Kansas City didn’t fair as well as it would have liked, going 4-6. The only series KC was able to win was against the Indians, taking 2-of-3. Against Toronto, the Royals were never able to slow down the Blue Jays’ bats, giving up a plethora of home runs to the likes of Josh Donaldson, Joey Bautista, and the newly acquired Troy Tulowitzski. Against Detroit, the Royals were expected to come away with a series win against a team that had all but thrown up the white flag this season. Sitting at three games under .500, the Tigers sent off ace David Price, and offensive talent Yoenis Cespedes. With so much talent but having under-performed this season, it seemed likely the Royals would come in and have their way with the Tigers, particularly with Johnny Cueto and Yordano Ventura pitching. Cueto wasn’t able to receive the run support from his offense in a 2-1 loss on Wednesday, while Ventura gave up two home runs to give Detroit a 6-3 lead before the Royals would rally in the ninth to tie it, but eventually falling to an Ian Kinsler walk-off homer in the bottom of the ninth off Ryan Madson. Now at 63-44, it certainly isn’t anywhere near panic time for Royals fans, but coming home to take on the lowly White Sox, followed by some potential payback against the Tigers is just want Ned Yost and his team needs as they wind down the season. Unfortunately for Kansas City, Mike Moustakas, among others, has been in a somewhat extended slump. Thursday, with the bases loaded, Moustakas popped out to third to end the inning and the chance to take the lead heading into the final at-bat for Detroit. Ending July, Moustakas was hitting a meager .211 and struggling to give the Royals anything offensively. Ned Yost opted to slide him in the order, down to the 6th spot and bumping Zobrist to the two-spot behind Alcides Escobar. Since trading for Zobrist and Cueto, the Royals have faltered. Cueto has thrown twice, finishing with a no-decision 7-6 loss to the Blue Jays, and a loss in a tough pitching battle against the Tigers, Wednesday. Zobrist hit 3 home runs in two days against the Jays, and almost single-handedly won the third game in the series with his hitting. The two newcomers now have the chance to play in front of the home crowd for the first time as members of the organization, which should serve as a huge lift for the team heading into a 10-game home stand. 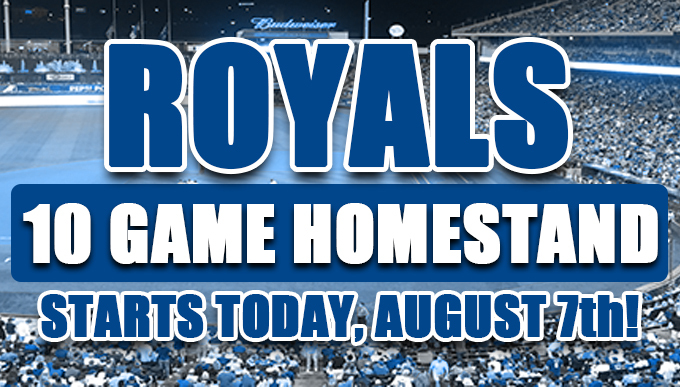 Tickets for this weekend’s series against the Chicago White Sox, as well as upcoming home series with the Detroit Tigers and the Los Angeles Angels, are available today at Tickets For Less, where you can find the best seats inside Kauffman Stadium. Don’t miss the action. Get your tickets, today!